The school is preparing the students for India’s strong “global economy”. Fashion Technology is one of key domains for the future. We are providing excellent facilities in this field. The school has latest equipment to facilitate at least 30 students in high-tech lab. The equipment ranges from the size 8 dress forus (mannequin) to the measuring scales and latest sewing machines. The dress forus helps in performing the test fits and draping exercises. The fashion lab also provides 6 sewing machines which are both hand and paddle driven. The flat pattern tables help the students to perform the skill more efficiently. These facilities have helped and encouraged students to take up this professional course at school level and also given the basis to pursue it at higher levels. 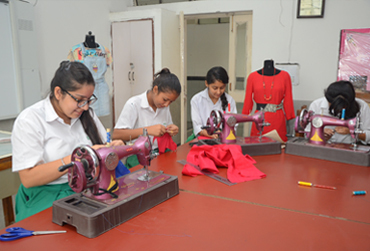 Our student are being selected in prestigious institutes like NIFT and Pearl Academy.